Posted on May 16, 2015	by Thomas J. Neal, Ph.D. The new Pew survey on religious affiliation in America, released and much discussed around the internet yesterday, paints a portrait of institutional Christianity in retreat, and the continuing rise of what we call the “nones” — people attached to no organized religion — as a major constituency in American life. The pace of both trends is striking: As Notre Dame’s David Campbell, quoted in this Daily Caller piece, points out, given how quickly the non-affiliated population rose in the late 1990s and early 2000s you might have expected a slowing or a leveling off, but instead the trendline is still steep, from 16 percent “none” in 2007 to 23 percent today (and about 35 percent “none” among Millennials). Meanwhile identification with every major branch of Christianity is down in percentage terms, and only evangelical Christianity is seeing its absolute numbers still increase; the black Protestant churches are holding steady, but in Pew’s numbers Catholicism seems to have joined the Protestant Mainline in a kind of demographic freefall. 1) What’s in steepest decline is affiliation, not religious practice. What we’re clearly seeing happen, in Bible Belt environs as well as on the liberal coasts, is people who once would have identified as Christians socially (as Christmas-and-Easter Methodists, cultural Catholics, etc.) are now dropping the label altogether. In terms of religious practice, however, the trend is less stark: Using Pew’s own numbers, you’ll see that 39 percent of American reported attending church weekly in 2003; in 2013 it was only down two points, to 37 percent. That undoubtedly overstates true attendance patterns, since people tend to fib and fudge and misremember; real weekly attendance is probably somewhere in the 15-25 percent range. But there aren’t obvious reasons to think that many more people are fibbing or misremembering today than ten years ago; if anything, since cultural Christianity has weakened, the “social desirability bias” driving people to tell pollsters they’re churchgoers should be weakening apace as well. So it’s unlikely that the Pew numbers on reported attendance are masking a major plunge: Instead, what’s happening is that American Christianity is losing more and more of its penumbra while retaining more of its core (albeit an aging core, in many cases) than trends in identification alone suggest. 2) Catholicism might not be in quite as dire shape as it seems. The plunge in Catholic adherence might be the most surprising thing in the Pew data, since for a long time overall Catholic numbers have been kept up by immigration even as white Catholics have drifted away. But some surprises are just polling outliers: For a contrary take, read Mark Gray, who blogs for Georgetown’s Center for Applied Research in the Apostolate, often the best source for Catholic data, and who has been critical of portraits of looming Catholic collapse in the past. Gray notes that when you compare this survey to others like it (the GSS, Gallup, etc.) 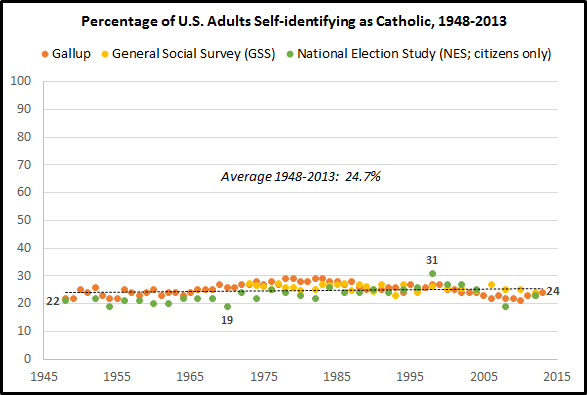 the Pew numbers for Catholic identification are way down at the bottom of the scatterplot. Maybe this means that Pew really has honed the perfect poll questions and captured exactly the right sample. But it’s just as likely that the average rather than the outlier is closer to the truth, in which case Catholic numbers look more stable, hovering around 23 percent of the US population, close to where they’ve been for a very long time. Pew’s stark graphic showing Catholicism losing six cradle Catholics for every non-Catholic who converts, compared to far better ratios for evangelicalism and even the Mainline, also may overstate the Roman’s church’s problems, since it doesn’t capture all the denominational churn within Protestantism (a Presbyterian becoming a Baptist or vice versa). If you compare Catholicism to specific Protestant churches rather than broader umbrella categories, the Catholic retention rate looks a lot better; at worst in the middle of the pack, and more likely well above average. The fact that so many cradle Catholics are leaping to Protestant denominations is a sign, clearly, of Catholicism’s post-1960s convergence with Protestant norms and habits (visible in mass attendance and many other indicators as well), and that convergence as a general phenomenon is not good news for the faith. But neither is it quite the demographic crisis that a quick look at Pew’s comparisons might suggest. 3) So much depends upon how and when and whether the Millennials grow up. Historically in American life it’s been normal for people to drift away from church or organized religion in their twenties and then circle back once they get married and (especially) have kids. (Catholicism, in particular, gets an awful lot of reverts, another under-studied part of why its overall numbers have held up.) And at least part — not all, there are clearly big ideological and theological issues, but part — of what we’re seeing in the Pew figures is that as the period of drifting has expanded into people’s late 20s and early 30s, with marriage and family getting pushed ever-further back, the drifters themselves become less likely to formally affiliate with their parents’ church, and more likely to see themselves as actually lapsed, ex-Christians, what-have-you, instead of just as people taking a long young-adult break from churchgoing. So the question facing institutional religion, then, is connected to the questions facing the institution of marriage and hovering over the future of the family: Namely, will the Millennial generation eventually enter the unions that they haven’t entered yet, have the babies that they’re delaying having, and end up reconnecting with their parents’ religion (or some other) when they do? Or will a lengthened adultescence plus the impact of the Great Recession ultimately lead to fewer marriages, fewer kids, and less re-entry into religious community over the course of the life cycle? Of course these things could become unbundled; the marriages could happen but not the return to religion. But for now, given how closely they’re still bound for many people, America’s churches can still reasonably hope that in faith as well as family, what’s postponed may not be permanently foregone. I don’t mean any of these points to recast this report as somehowgood news for American Christianity. To make that case you have to go a step further, and talk about how a merely “cultural” Christianity is bad for true Christian faith — a point that I think has merit, but that deserves heavy qualification as well. But that’s an argument for another post; for now, consider this one just an attempt to discern shades of gray and hints of silver in and around institutional Christianity’s darkening sky.